A man has been injured in an early morning crash involving two lorries which caused long delays on the M74 motorway in South Lanarkshire. The incident happened on the northbound carriageway at about 05:10, between J5 at the Raith interchange near Hamilton, and the M73 slip road at J4. One driver was cut free and taken to hospital. The other was uninjured. Drivers experienced delays of more than 90 minutes while the road was closed. It re-opened at about 08:30. 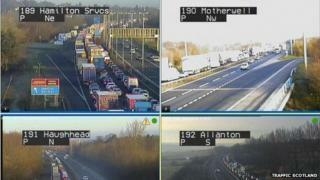 The Scottish Fire and Rescue Service said crews were mobilised from Hamilton, Easterhouse and Clydebank. Watch Manager Graham Hunter, the incident commander, said: "The collision involved two HGVs and left one man trapped by the legs. "Firefighters immediately began work to free the casualty - this involved using hydraulic cutting equipment to extricate him and setting up a platform so he could then be removed on a rescue board. "Our police colleagues closed the motorway to ensure the safety of everyone at the scene and paramedics were attending to the casualty while we worked to release him." After being lifted clear of the lorry, the injured driver was taken by ambulance to Monklands Hospital.